For hassle-free healthy soups, you will need to be prepared with a properly stocked kitchen. This means you will need to have some handy ingredients that will make soup on a whim. It will save you some precious time on those busy nights when you don’t want to go looking for a specific ingredient halfway through a recipe. In these ingredients, we are also going to talk about pots which will also help to upgrade your soup-making technique. Remember that cooking soup is much more efficient with the right equipment. Here, we are talking about a stockpot which is one of those kitchen utensils that you can’t go without when making soup. A stockpot is typically larger than the usual cooking pot. Since soup is mostly broth or water, you will want a stockpot that can hold as much as 10quart when making soup for a large family. A heavy saucepan can also do the job provided it has a construction of iron or enamel which allows slow cooking. When you want to come home to the aroma of ready soup, a crock pot is an ideal choice since it allows slow cooking. On the other hand, if you don’t want to wait all day, a soup maker will also give you flavourful soup in just a couple of minutes. When you need to boil stuff like beans and lentils, we advocate going for a pressure cooker. This is the stock or broth that gives your soup a particular flavor. Most of us go for the shop-bought stock which may carry lots of added salt and preservatives. Making your stock from scratch is far more satisfying as it will have customized flavour and you will know the exact ingredients in the stock. The most common bases are from chicken, beef, or fish stock. Other people prefer broth which comes from boiled meat instead of bones. After you choose your stock, next, you’ll need to pick the vegetables and meat. These include green beans, green peas, mushroom, broccoli, lentils, beans, and tofu. They are great if you want an entirely vegetarian soup. These ingredients will provide the proteins needed for any diet so that your soup will be more filling. A mixture of the two types of vegetables is essential for excellent health. They also add color to your soup so that it won’t be too plain. These vegetables include collards, spinach, kale, dandelion, chard, green peppers, and turnip. These greens have a strong flavour, but they come with the benefits of being nutrient heavy. They pack vitamins, folate, and fibre which makes your soup filling so that it can stay longer in your stomach. These are the spicy type which have an enormous impact on the flavour. They include; onions, garlic, celery, ginger, shallot, and leek. These are sweet veggies like carrots, potatoes, sweet potatoes, butternut squash, turnip, parsnip, and winter squash. These vegetables can also be combined with pears and sweet apples and tart for even more colour. Excellent seasoning is what will draw your kids to the kitchen. Not many people enjoy the taste of butternut squash combined with sweet potatoes and spinach. It is not that tasty for picky eaters, but if you throw in some herbs, they accentuate the flavours to make the soup a real delicacy. The essential herbs are parsley, oregano, thyme, basil, sage, cumin, rosemary, and tarragon. Creams soups, for example, will benefit from thyme or parsley while beef soups taste well with thyme or rosemary. Chicken soups go well with thyme, parsley, celery seed, sage, and marjoram. If you want to prepare a tomato-based soup, you will like it more with oregano, fennel, or basil. As usual, you will still require to season with some salt. You can go with the usual sea salt, or opt for soy sauce, Coconut Aminos, or Miso. 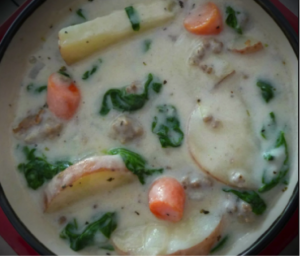 Most people like to use meat in their soup as it is denser and filling. It also makes the soup more flavourful. You will want your meat sauce to match your stock. If you are making chicken soup, ensure that you use chicken stock and so on for meat and fish. The quality of your oil will dictate the overall taste of your soup. That’s why we recommend high-quality oil like extra-virgin olive oil, coconut oil, roasted walnut, or toasted sesame. These oils contain good fats which lower the risk of heart disease. They are also packed with powerful antioxidants so your soup will be not only tasty, but also healthy. These are the last part of preparing your soup. They are indeed essential as they turn any plain soup into a masterpiece. They also make your soup more appealing so that you can get everyone indulging. Remember that we start eating with our eyes. Mushroom, sage, basil, parsley, cilantro, chipotle, and Tuscan garlic are some of those herbs that improve the taste and beauty of your soup when flash fried with oil. Sour cream is the most common and the easiest to make. You can also use mayonnaise, wasabi, or yoghurt. Here we are talking about such toppings as fried sage, minced fresh parsley, toasted walnuts, shredded parmesan cheese, salsa, tortilla chips, green onions, sesame seeds, etc. If you have most of these ingredients, you can start making soup right away. Here are two of our most straightforward recipes using some of the ingredients on this list. This is the ultimate comfort food on a cold winter day or when you are under the weather. This soup makes a whole lot of difference between the shop-bought soup and this homemade kitchen soup. It is even healthier since it has more meat than canned soup. Our recipe will yield six servings of warm, high-nutrient soup. Add the green peppers and celery and continue stirring for around 3 minutes. This soup is also packed with lots of veggies and nutrients. It uses basic ingredients that are simple and spicy to get you warm in cold weather. The cooking time for this soup is about half an hour. Use a large stockpot to heat the olive oil. As you can see, making soup is as easy as having the staple ingredients in your kitchen. You can stock up with fresh vegetables in autumn and get ready for the winter months. All you will need is a few recipes to get you going, and you are good to go. Soup is versatile. It is a great way to have all the nutrients you need in one bowl. It is easy to prepare such that you can make one big batch and freeze until the cold season arrives. And if you are not willing to wait a few weeks, you can start enjoying delicious soups right away. Here are FIVE recipes for Best Soup for Bodybuilders. They are packed with protein to supply the muscles with the nutrients that every active man or woman needs. These soups are great as starter meals and side dishes. Any recipe with the words muscle building is guaranteed to be packed with proteins and low in fat. That is exactly what the Muscle-Building Chilli is all about. This recipe can make up to 10 servings so you can either have it with friends and family or freeze the leftovers. Turn the heat on medium; add the olive oil, garlic, and onion. This soup can make a rich starter meal or you can have it for lunch. We’ll be making eight servings with this recipe. It is super easy to make and it only requires about 45 minutes to prepare. Use a large stockpot to melt the butter or olive oil. This recipe contains only 273 calories per serving with 16 grams of protein, 20 grams of carbohydrates, and 16 grams fat. It has the delicious flavour of salmon, spices, with a touch or chicken. It can be a great pre-workout soup because it has a high carb quantity which will be great as an energy source. This soup has high amounts of protein. It will come in handy as a post-workout meal to facilitate healing and repair of torn muscles. It contains macronutrients which nourish the muscles so you can heal faster and have more energy to take on more weights. This soup comes with plenty of flavour. You can serve it with low-fat cream or low-fat cheddar cheese. It will help you warm up before a workout or even as a post-workout snack. Heat the olive oil in a medium-sized pot and place the turkey in the pot. Set the heat on medium-high and brown the turkey for 3 minutes. Let the turkey brown well on both sides. Pour in the water and stir in the garlic, tomatoes, and kidney beans. Bring the mixture to a boil, then reduce the heat and wait for it to simmer for another 30 minutes. You can again garnish this soup with cheddar cheese or sour cream for more flavour. This is not your regular chicken soup with lots of water and vegetables. We’ll be beefing this up with more carbs and nutrient-dense ingredients. You can take this soup at any time of the day from breakfast or with dinner alongside rosemary olive bread or an apple sandwich. Pour the chicken broth and water into a medium-sized pot and bring to a simmer. You can also add some pasta at the last step to up your carbohydrates intake. Pork is considered a good protein source more so after trimming the fat away. This recipe has only 9 grams of fat but it will provide you with almost half the ideal protein portion for bodybuilding. When the wonton wrappers become tender, add the scallion greens, cilantro, chilli peppers, and lime wedges before serving. This recipe gives you 4-6 servings. As always, you can refrigerate the leftovers so you can have a bowl to come to after a day of heavy lifting. It provides the convenience of comfort especially if you are craving a comfort food that is warm. Every bodybuilder needs to eat healthy food sources for bulking up. The best protein sources are from lean meats but canned soups do not cater for such needs. That’s why we have chosen these recipes to help you maintain quality mass and strength. There no need to reach for a milkshake after a workout when you can have these soups that are both filling and are full of high nutritional value. There’s nothing more adaptable than soup. You can eat it hot or chilled, as starter or side dish, and even as a main meal. These best soup books give us a collection of all our favourite soup recipes. In this list, you will find cookbooks written from personal experiences to help you understand where each author is drawing from. It could be their grandma’s kitchen or a trip to an exciting destination. These soup recipe books have also been given as gifts meaning they are loved enough to be recommended. We hope you will love them as much as we did. From the title, you can tell what this soup book is all about. If you look forward to shedding some weight and have no idea how to go about a soup diet, you will love this soup book by CookNation. It gives you a set of 80 recipes for well-thought flavour-packed soups ranging from 100-300 calories. All you need is incorporate these soups in your meals as they help you feel full so you won’t find yourself eating more calories or compensating later. This recipe book covers various kinds of soups from vegetarian to dairy-free, gluten-free, and vegan recipes. You will also find recipes for hangover soups and restorative soups. The recipes all minimize the use of cream and butter as these ingredients are substituted with olive oil and nut oils. All the soups in this book can be prepared in less than 30 minutes with the help of a soup maker. But since it uses fresh and seasonal ingredients, it is easily adaptable to the traditional stove-top. Losing weight and eating healthy will get easier as you start eating more soup and choosing healthy food. Soup can be easy to make but it can also be sophisticated. The New Covenant Garden Soup Company has been around for some time. With an aim to help you get innovative, it gives you 365 soup recipes where you can choose one to prepare every day. You are sure to make tasty recipes using natural and fresh ingredients. You can pull a recipe for just any occasion from family gatherings to an afternoon spent with friends. Not to mention, it also carries recipes for all seasons so you won’t be waiting for the cold season to enjoy your soup. Do you crave the taste of Italian food? Michelle Scicolone brings you this convenience in the best selling Italian Soup Recipe Book. This soup book combines the exuberant flavours of fresh Italian food. It follows simple techniques with the help of a slow cooker meaning you don’t have to be a veteran in the kitchen to make tasty soup that everyone in the family will love. This book goes beyond the usual simple techniques that use the usual ingredients to make carefree soup. Even if you don’t have an hour to prepare the soup, you get a chance to toss in the ingredients and hours later, the perfect soup will be waiting. This soup book is inspired by a passion for what people like to eat. From the time that Marjorie read about the stone soup, she has always wanted to create something from our most common picks for everyday dining. The book presents us with 100 recipes from New England Soup Factory Restaurant. You get to recreate what is on their menu which consists of traditional and best-tasting creative soups. Not only that, you have an additional page of salads and sandwiches to accompany your soup. If you own a soup maker, this recipe book is your best bet for making the most of your soup making machine. It allows you to make homemade soups from scratch even if you are a discriminating cook or you rarely have time to conjure soup. Liana Green includes soup recipes for everyone including traditional soups like chicken soup, leek, tomato soup to more unique ones like Turkey with ginger and cauliflower cheese. Now you can indulge in soups that improve your health and even help picky eaters eat more vegetables. Soup is everyone’s comfort food. You will rarely mess up soup, but ideas can run out fast. But Sarah Lewis gives us a professional look in making low-fat, high-nutrient soups. It gives you 200 recipes from classic soups like potato and parsley soup to exotic ideas of making chilled soups for the summer. Sarah Lewis provides you with easy-to-follow instructions accompanied by colourful pictures so that you know exactly how your soup will look like when you make it. She gives you a set of metrics which are easy to use either in Kg or pounds so that you can use familiar measurements. This book entails well-thought instructions like how to make different kinds of stock from scratch. From chicken to fish and vegetable stock, you will no longer be buying canned stock when you can make your own. Sarah draws from life experiences and of course her grandmother’s kitchen. She will leave you all smiles with the best soup recipes. If you value knowing the numbers in your food, this recipe book will be of great help. It gives you the values for the carbs, proteins, fibre, and fat content in every soup you make. It also contains 5-day plans so you can plan ahead and have all the ingredients ahead of time. You also get 1700 food and drink photos so you will get a visual idea of the calories you need to take in a day. The soups range from low-calorie recipes to high-fibre and high-protein soups. It also gives you the ideal accompaniments for each type of soup meaning you are not stuck with bread. This recipe book also advocates homemade soup. It offers you hearty and healthy soups so that you can get good results each time. With this book, you will discover over 150 soup recipes that we have all come to love. It also includes traditional recipes like pumpkin and potato soup. It also gives us other unusual recipes like the Portuguese and Pomegranate soup. This book gives you access to handy tips for making a puree and also making stock. All the techniques are explained step-by-step meaning you will know the cooking times and nutrition information of your ingredients. This soup book will come in handy for making revolutionized soups all year round. The Good Food Soup Book provides you with all the recipes you’d ever need from summery lunches to weeknight side dishes for the winter. If you don’t have an idea when it comes to dinners and starters, this book will be an asset to your dining table. With 101 soups and side dishes, you have will have more than enough inspiration for everyday soup making. With each recipe comes a breakdown of the nutritional value. If you want to make healthier food choices or you are on a weight loss journey, this book will provide you a good idea of the calories you are taking. It has colour photographs that help you make the process easier and the end result becomes much more satisfying. Sharon Brown also offers you great ideas about making fresh salads and chilled seasonal soups. The good thing is that it is triple-tested by UK’s best-selling cookery magazine; Good Food. As such, you can take on these recipes with complete confidence. There are hundreds of soup recipes, but if you want to be a master of just a few, here’s a recipe book that you will love. This book gives you a variety of soups which will get you eating soup every day. In fact, Teresa Mary Carr has discovered all-time-favourite soups from Thai to French, Jamaican, Chinese, and even Moroccan soup recipes. This soup book teaches you how to be an expert in the kitchen. You will no longer have to buy soup in a tin as it gives you the inspiration to start enjoying diversified soups with low salt, and with your chosen ingredients. Teresa Mary Carr gives you a brief description of every soup in her book. This gives you an idea of where the soup originated and why it is was beneficial then and now. You will find interesting stories about the people who love that particular kind of soup so you too can indulge with confidence. These soup recipe books are the total package. They cover delicious recipes that are aimed at getting you to eat more soup. They also include beautiful photography alongside the soups we’ve come to love on our dining tables. These writers share their inspiration and intriguing stories of their love for soup. We believe they will be kitchen staples that will be passed on from generation to generation.